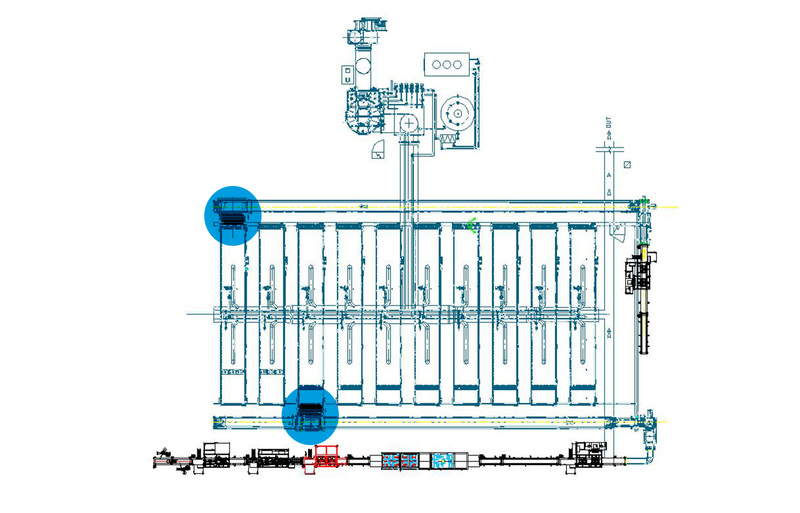 The loading shuttle has the purpose to load the batteries that arrive from loading conveyors into formation tanks. It has a mainframe made of stainless steel AISI 316L tubulars that embraces the battery transport conveyor. Shuttle runs along special rails palced on the conveyors, and moved by gear motor completed with system of sprockets and rack. On board of the frame there is a pusher, moved by trapezoidal screw and gear motor, and complete with sensor of right positioning (forward/backward). The coupling btween the loading shuttle and selected tank is obtained by a slide that rotates and leans itself on leans itself on the tank when the shuttle arrive in front of the selected tank. The unloading shuttle is similar to loading shuttle, but it has the purpose to unload to batteries at the exit of formation tank and place them selves on the unloading conveyors of formation tanks. The unloading shuttle has a mainframe made of stainless steel AISI 316L tubulars that embraces the battery transport conveyor. Shuttle runs along special rails palced on the conveyors and it is moved by gear motor completed with system of sprockets and rack. On board of the frame there is a ‘mobile door’ that runs along the guides by two cylinders. One cylinder allows the ascent/descent of ‘mobile door’ and the other allows the forward/backward movement of ‘mobile door’. The coupling between the unloading shuttle and selected tank is obtained by motorized roll conveyor placed on board of the shuttle. Roll conveyor rotates to 90°, positioning itself into the formation tank at the same level of the tank conveyor. On board of each shuttle (loading and/or unloading) there is a derivation electrical cabinet, connected to general electrical panel of management of formation plant.